MOT testing bookable online with R&B Vehicle Services. Welcome to R&B Vehicle Services - MOT Testing & Servicing in Tetbury, Gloucestershire. At R&B Vehicle Services, our fully qualified technicians are able to perform MOT Testing, all makes servicing, tyres, air-conditioning as well as general vehicle repairs at our garage in Tetbury, Gloucestershire. Our garage has been servicing Tetbury for many years, providing a wide range of garage services and expertise. We're a one stop shop for anything that you may require for your car as we're able to perform anything from the MOT and tyres to repairs and diagnostics. 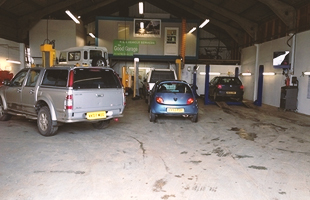 We offer quality services in Tetbury from MOT, car servicing and tyres to cambelts and brakes. Come to us for all your garage services, located in Tetbury near Didmarton, Willesley, Westonbirt and other surrounding areas in Gloucestershire. We can assure you that our expert mechanics will provide the best possible service for your MOT and servicing. Here at R&B Vehicle services located near Tetbury, we go the extra mile for our customers. We're open Monday to Friday, between the hours of 8:00am and 17:00pm. Book your MOT test online. Our state of the art booking system allows you to book the MOT test online at our local garage in Tetbury. You can select the MOT you require (including getting an exact price for a service) and you can then select a date & time that suits you. You'll book your appointment directly into our live MOT diary, so you can turn up for your booking with confidence. Once you complete your booking, you'll instantly receive an email confirmation with all of your booking details. For more information on any of our MOT, servicing and tyres services we offer in Tetbury contact us on 01454 238700 or send us an email.